The problem revolves around Reem's Cafe...or, as I like to think of it, Reem Assil's Racist Flatbread and Terror Joint. Odeh, along with her partner, Aisha Odeh and their friends within the Popular Front for the Liberation of Palestine (PFLP), killed 21-year-old Leon Kanner of Netanya, Israel, and 22-year-old Eddie Joffe on February 21, 1969, in a Jerusalem grocery. I find it profoundly disconcerting that within living memory of the Shoah - the genocide of the Jews - the very city that I live in, a city that proudly claims itself against race hate is perfectly comfortable... with race hate. What the City of Oakland is showing the rest of the United States is that urinating on Jews is just fine and that honoring the murderers of innocent Jews in a public manner is a righteous matter of "social justice." So on that perfectly beautiful Sunday afternoon those who despise Israel sat with Reem Assil in the cafe - in a closed, RSVP-Only event - and discussed with professor Sunaina Maira (UC Davis), author of Boycott! : The Academy and Justice for Palestine, how best to eliminate Jewish self-determination and self-defense from the world stage. Jewish people and friends of Jewish people - maybe twenty of us total - stood outside in the courtyard beside the leadership of Faith Meltzer, Susan George, and Matthew Finkelstein. George Kelly: Did the group begin in response to Reem's opening? Lara Kiswani: Today there is an event here that is put on by Sunaina Maira who published a book through the University of California about the boycott, divestment, and sanctions movement... And so, because of the event and the subject matter is about BDS, boycott, divestment, and sanctions, Israel, and that is we are being critical of apartheid and the colonialist state of Israel at this time, the demonstrators have called for another protest today. Kiswani also refers to the Jewish people and friends of Jewish people who object to the mural of a Jew murderer as "racist." The fundamental difference between Meltzer and Kiswani - aside from the fact that Meltzer cares about the well-being of the tiny Jewish minority around the world and Kiswani obviously does not - is that Meltzer wants to organize against the murder and hatred of Jewish people while Kiswani, despite her best intentions, promotes it. While Meltzer stood before the press directly prior to the vigil/protest at Reem's, Susan George and Matthew Finkelstein endeavored to talk to Reem's anti-liberal supporters. We can unpack that question... we can put it into the nicest possible terms... but we can only do so through dialogue and dialogue is the very foundation of Enlightenment liberalism. 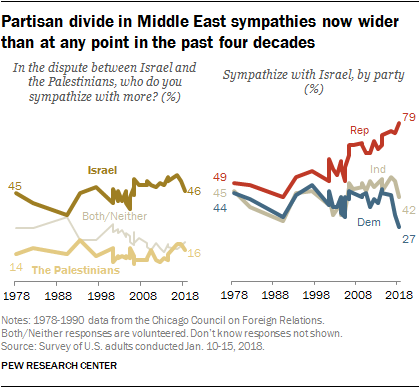 According to 2018 Pew polling, 79 percent of Republicans sympathize more with Israel - by which they essentially mean the Jews - than they do with the Palestinian-Arabs. Awww...and here I was thinking I was going to hear more about affrays in a Michigan courtroom. There was me thinking you would actually condemned such hate? Where people glorify terrorism and the murder of Jews. You think I'm in favor of an assault in a courtroom? I'll leave that cause to you.